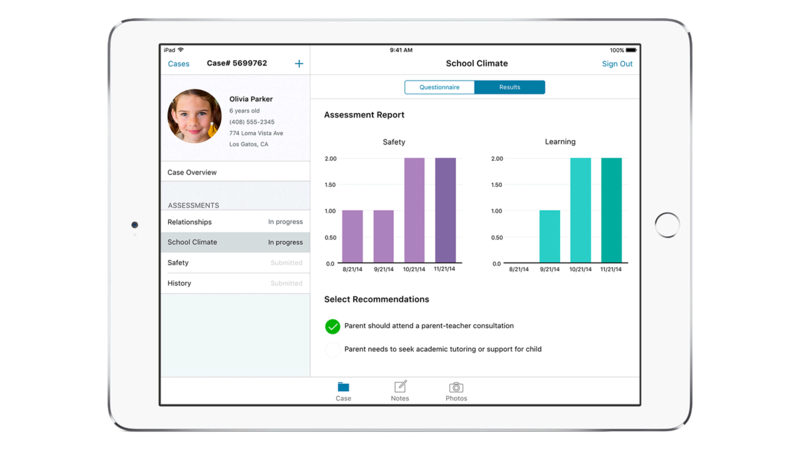 IBM MobileFirst for iOS Case Advice helps traveling social workers access case history, assess individuals and make urgent decisions with analytical tools. Log in to Case Advice to see your day’s caseload. Tap a case card to see each name, issue, address, visit time, phone, and a map of the location. Tap again to get directions. Once you’ve arrived, your iPad logs your time and location so your team can always find you and an audit trail is automatically created. In the home, the case card opens to the case narrative, detailed information, rules and regulations and assessments, giving you the same information you would have in your office. Your caseload is prioritized by critical incident alerts that demand quick response and required next actions. When you complete an assessment, you’ll see a set of recommendations based on legal and organizational requirements. Tap to speak with experts, access protocols or guidebooks, and see recommendations. The case history updates based on your assessment, and automatically displays case progress over time to help you make the best decision, fast. While completing assessments or reviewing case histories and notes, add visual evidence by touching the photo icon on the record – your iPad camera is integrated without the need to open another application. Photos and videos are date and time stamped automatically and sorted by date for easy retrieval for court if necessary. Also organize images into folders you create using drag-and-drop. Touch the Notes icon at the bottom to quickly draw, write or speak a note.